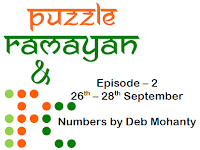 Episode 2 of Puzzle Ramayan will take place from 26th September to 28th September, 2015 at Logic Masters India website. This round is authored by Deb Mohanty. 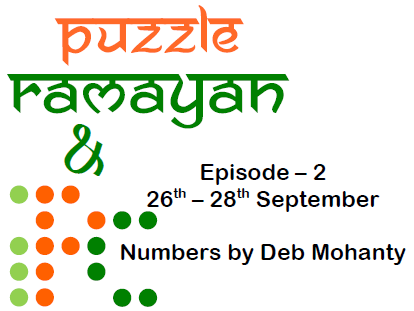 Puzzle Ramayan rounds will also serve as qualifiers for Indian Puzzle Championship for year 2016. Theme of this round is Numbers and all the puzzle are based upon this theme of numbers. List of puzzles appearing in this championship is given below with the links to the practice puzzles. Please do note that these practice puzzles may not exactly similar to the PR puzzles. However these will server a good practice for Puzzle Ramayan. Looking forward to this round eagerly.